Insuring municipal bonds on the other hand, could be a really really big deal. While this is a stretch of the imigination, if Berkshire were to insure municipal bonds in all 50 states, this business could have an effect on Berkshire Hathaway much the same way that GIECO did in the 1980's and 1990's. A couple of months ago, Buffett committed about $150 million to the newly formed Berkshire Hathaway Assurance Corp., the newly formed entity created to insure municipal bonds in New York. This morning Buffett agreed to committ $5 billion to take over the municipal bond business of MBIA, Ambac,. etc. And he could do it in 5 days. Below is the letter sent by Ajit Jain, President of BH Reinsurance to MBIA's Bankers at Lazard. As you know, many constituencies in the financial markets have been increasingly focused on the emerging issues in the financial guaranty industry for several weeks now. In fact, we ourselves have had several meetings with the New York Insurance Department to explore whether there is something we can do under the current circumstances that would be helpful in addressing the growing concerns in the financial marketplace. Unfortunately, the structured finance "side" of the business, with its many moving pieces and interdependent variables, has proven to be beyond our ability to adequately analyze. Nonetheless, we are ready and willing to lend our reinsurance support to the municipal side of the house, and in fact had set out in a letter to the New York Superintendent of Insurance a concept that we believe would address the needs and concerns of main street America's municipalities. The Superintendent has no objection to our approaching you with this proposal. We would like to meet with you and your client, MBIA, to discuss whether MBIA would have any interest in the proposal . The key elements of the proposal we described to the Superintendent were: (1) we would raise the capital level in our monoline insurer, Berkshire Hathaway Assurance Corporation (BHAC), to $5 billion; (2) we would assume by reinsurance the muni bond portfolio of several of the monoline companies for a premium of 150% of the existing unearned premium reserves of the companies (with respect to two of the leading companies this would result in a combined unearned premium reserve of $6 billion, plus $3 billion for a total premium of $9 billion which, with the increased capital contribution to BHAC would result in approximately $14 billion of assets available to meet the combined $600 billion or so of total principal value of municipal bonds insured by these two companies); (3) we would undertake not to reduce BHAC's assets by dividends, fees, etc., for a minimum period of ten years; and (4) we had furthermore proposed that, if the companies found a preferable solution during the first 30 days of our cover, they could have a no-questions-asked walk-away option in consideration of a break-up fee that would be paid to us. The gist of our proposal to you is that we would reinsure MBIA's current municipal bond insurance portfolio in consideration of a premium payment to us of an amount equal to 150% of the existing unearned premium reserves. Like many potential reinsurance buyers, I recognize that your first reaction may be that this is an excessive premium, and I want to offer you upfront the thought processes that led me to conclude that this is in fact a fair proposal that achieves important objectives for both parties. We priced this proposed reinsurance cover to reflect the significant opportunity cost from our perspective in providing this type of bulk reinsurance cover. In the current market environment, we are able to command premium levels double (or higher) your client's prior rates to insure the risks that in addition have the benefit of your client's AAA insurance cover. Given our conservative use of capital (for example, the capital ratios in our monoline insurer would be higher than other insurers and would not be subject to reduction by dividends, fees, etc. for a minimum of ten years under the concept we presented to the Department), by offering this cover we forgo these direct opportunities to wrap already wrapped bonds. Despite this, there is an obvious appeal to a bulk transaction like this given the low overhead costs which would be involved. Taking all these factors into account, we came down in favor of making the proposal and are prepared to pursue it with you directly. It is efficient as both a bulk transaction and a transaction that we believe will help stabilize the currently unstable marketplace conditions for the municipal business. In that sense, this approach also has the appeal of serving the greater public good, not an unimportant consideration for us, both as a matter of principle and as a company with a vested interest in national economic conditions. From your perspective, I would respectfully suggest that this proposal would allow MBIA to release substantial capital from the municipal bond side of the house that can be deployed to support other obligations. I would submit that our proposal at the pricing levels we require is actually a cheap way for MBIA to raise capital as compared to other alternatives and is therefore of great benefit to MBIA's owners and their municipal bond policyholders. Should this proposal prove to be of interest to you, and I sincerely hope that it is, we would ask for the courtesy of a reply as soon as possible. We would be prepared to complete this transaction within the next five days. It is much easier to buy and buy and buy little pieces of a wonderful group of American businesses, and you'll do fine over time and you'll keep your costs low. If you try to be a little bit smarter, you'll probably end up being a lot dumber. 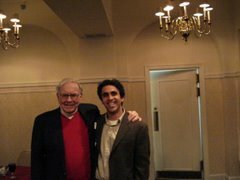 Warren Buffet was in Canada attending the BusinessWire debut there. He spent some time with the Financial Post discussing his thoughts on investing, and the general state of affairs. Both the written interview and video clip are provided below.